What I like about the auction format is threading the needle between spending/holding, showing restraint but knowing when to pounce, and then reacting to the surprises in the room. In auctions, one has to be flexible and creative at times to keep to the plan and/or budget, but also recognize opportunities when they arise. And then most importantly, to step out and capitalize on those opportunities even if it means shifting one's priorities. In this era of multi-position players, fantasy roster flexibility is also a consideration. Just like the progressive managers who take advantage of the Ben Zobrists and Yangervis Solartes of the world in crafting the best lineups, fantasy managers can open up new acquisition possibilities by rostering players that qualify at two or more positions. We know this can pay off in-season, when flexibility may allow picking up a higher-valued player in the free agent pool because of moveable roster pieces. But it also can play a big part in drafts and auctions—where you similarly can shift positions to make the best picks or bids, depending on what is available in the acquisition pool. Both of these notions of flexibility came in to play for me in the Tout Wars Mixed Auction League in 2018. As I walk through some of my pre-draft strategy and then relay how some aspects of my team came together, keep flexibility in mind. One of the things I noticed last year—my first in the Mixed Auction league—was just the speed at which the auction took place. While I felt I knew the player pool as a whole coming into my inaugural auction with this group, I wasn’t prepared for how quickly the players went from being nominated to that concluding “going once, going twice, …” And while I felt I did okay in acquiring players, I realized afterwards that my collection was a bit more scattershot than what I had anticipated. This year I was determined to spend more time with each positional group to become more familiar with issues of depth and player quality so I could adjust on the fly a bit better. In addition, knowing a bit more about some of the personalities in the room, and some insight in how they each liked to choose their squads, was a helpful preparation tool. So that's where I started once Jose Altuve, the first nomination, was called out. I won't go through all my picks, but here are a few thoughts on how flexibility played a role in this draft. I'm not usually one to go whole-hog on catching—I'm usually perfectly fine with grabbing two mid-level backstops and calling it a day. But this year, I noticed that beyond the top 3 (Sanchez, Contreras, Posey), production dropped of quickly, especially in terms of OBP. (I spent a good deal of time examining OBP, as most of my drafts this year so have been for BA leagues.) I was convinced Gary Sanchez was going to fetch a price into the mid-30s, and thought Willson Cortreras could, too—so much that for most of my prep time, I resigned myself that it was unlikely I would acquire either. But I was intrigued by Buster Posey, who I had valued at $21. I wondered if Posey came up for bid early enough—ideally before both Sanchez and Contreras—if being prepared to bid full price on him would be enough to acquire him. If I could nominate Posey before the other two came out, would fellow owners be focused on knowing that Sanchez/Contreras were still available, that Posey might go for at or under value? An $18-21 Posey would give my squad a real nice OBP floor, and ensure some production at catcher. The trick, of course, was that I had very little control over when Posey would come out. I wasn't aware of who might start the nominations in the room, and/or where I should be sitting to ensure I'd get this chance (ideally early in the round) to bring Posey up for bid. And of course secondarily, even if I did somehow secure an early nomination spot, there was no guarantee that Sanchez and/or Contreras wouldn't be brought up first anyway. At the risk of adding additional unnecessary pre-draft anxiety, I resigned to letting these chips fall where they may. If when I got to nominate my first player and no catchers were off the board, I'd bring up Posey and we'd go from there. Otherwise, I'd have a Plan B nomination ready. I, ahem, just had to be flexible. 2017 champ Jeff Zimmerman got the first throw, and after Altuve went for 49, Trout, Turner, Scherzer, Kershaw followed. I was positioned with the #7 nomination, one slot away. Joe Pisapia sat next to me and nominated ... Gary Sanchez. So close. Partially due to being pre-occupied with my possible Posey nomination (so much for reducing that anxiety), and trying to decide whether to stick to my nomination plan or not, I wasn't involved in the Sanchez bidding (again, assuming that it was likely he would exceed his $30 value). It was only later in which I realized that the bidding stopped at $30, and that there was at least some chance that I could have got him for $31—what I thought could have been a fair value for a player with a longer track record than the similarly-valued Contreras, for instance. But then it was time for my throw. I didn't think that a Posey nomination now, the next player after Sanchez, was a wise move. It seemed very possible that those who just lost out on Sanchez could inflate Posey's price. And I didn't want to nominate Contreras, as to spark possible Posey bidding war later when others realized the post-Posey gap. So, Chris Sale it was, and like that another $40 left the room. By the time my second nomination came around 15 players later, the catchers pool had not changed. With a $31 Christian Yelich in tow, this was my chance to move on the catcher. And so I uttered "Buster Posey, $12" to the bidding started. As it slowed around the $19 mark, I began to wonder if I had misread the catching market. "$20," I said, and someone soon went 21. "$22," said I, pushing a dollar past my valuation. And then Jeff Zimmerman went to $23, and I realized my hopes of rostering Posey at my valuation price were dashed. I couldn't bring myself to go $24, as I just didn't see the power upside to warrant a mid-20s return from Posey—at least not with so much other very good offense still in the player pool. And so, I had to be flexible yet again. Seven players later, Willson Contreras' name was called. I was in the bidding, but resigned to the eventual result. Surely another owner or two had targeted Contreras as a young breakout player, who, with a strong walk rate and power skills was ready to move into the Sanchez-lite category. Certainly someone was willing to pay up. Turns out, it was me. When the bidding stopped at 28, a dollar short of my projection, I had rostered Willson Contreras. He had not gone into the mid-30s, and ended up $2 less than Gary Sanchez—which again, was about the right amount of separation with in my projections. Flexibility, adaptation, and willingness to try and thread that needle—all were on display for me in my catcher quest in Tout Mixed Auction. I got my top catcher—it just wasn't who I thought it would be, nor was it in the manner I had planned. Again with OBP as my guide, four corner infielders beforehand emerged in a group of their own: Joey Votto, Paul Goldschmidt, Freddie Freeman and Kris Bryant. While I hoped to possibly be in the running for one of them, I knew that the elite players go for elite dollars in this league, and so also identified two other pockets of value. The first was the mid-20 group of third-base eligibles in Donaldson/Ramirez/Rendon/Bregman; the second was a larger mid-teens cluster of cornermen highlighted in blue bold in the screen capture above. So the plan was if I wasn't able to stomach the prices of the Votto/Goldy/Freeman/Bryant quartet, that I’d grab one player from each of those other tiers. Then Cody Bellinger showed up. He was not on my main-targets list because his OBP was a half-tick behind the others and he only has a one-year track record. But when his bidding stalled at $29, and RotoLab's valuations had him at $35, I jumped in at the chance for the bushels of HR and a $5 profit. Sold, to me, for $30. Then knowing I still wanted to grab one of the third basemen, and Ramirez gone for 32, I rode Bregman past my $23 valuation and secured for $30. I'm a big fan of the short swing, and think there’s another level of performance there, as he showed in the 2H and down the stretch. With Donaldson fetching $34 right after—a bit risker of a player in my opinion—I was thrilled with the Bregman buy. Again, being flexible on the fly—recognizing the potential profit in Bellinger, going far above my number on Bregman—set me up with a solid foundation. The other unintended result was that both of these very good corner players had dual-position eligibility—Bellinger could move to the outfield, and Bregman could move to SS or MIF. As the auction progressed, this opened up opportunities in bidding on and slotting players. For most of the draft, I was comfortable bidding on pretty much anyone, knowing that with those two, I could accommodate just about any other player. Indeed, Bregman ended up as a MIF on my final roster, allowing me to take advantage of mid- and late-draft bargains like $13 Nick Castellanos (himself 3B/OF eligible), $10 Justin Bour, $5 Logan Morrison, and $3 Matt Chapman. The flexibility paid off, as I able to fill out my hitting side mostly with players I had loosely targeted. As for the pitchers, I kept it cheap, and thus did not roster any of the big names. But, with a staff that includes Luis Castillo, Luke Weaver, Dylan Bundy and Sean Manaea, I've got several chances for a young guy or two to take that next step up. I'll need to monitor saves throughout the season, as Brad Hand is the only sure-fire closer right now (though I did tuck Brad Zeigler onto my reserve list, along with Kolten Wong, Dansby Swanson, Reynaldo Lopez, Kyle Gibson and Trey Hildenberger). 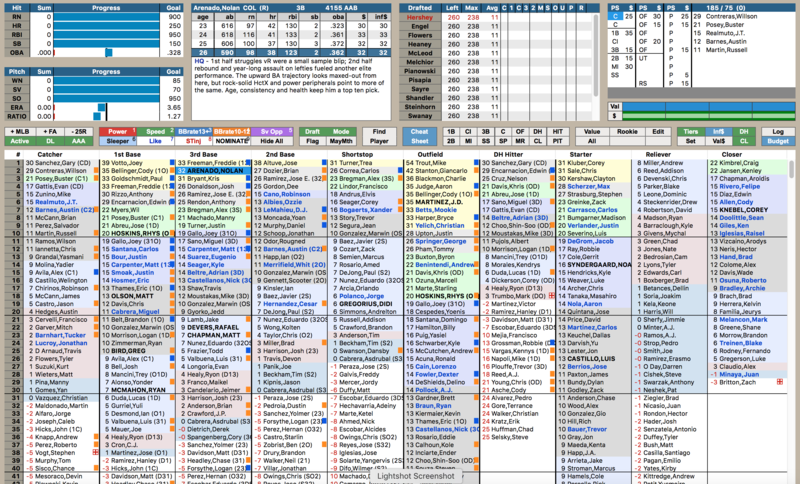 My complete active roster is below; you can also access all of the Tout Wars league rosters here; use the tabs to show the specific leagues. After all that, I'm ready to get started ... but I'll be glad to answer questions in the comments field below. Opening Day is less than a week away. Let's go!